A day ahead of tomorrow's series premiere, Disney Channels Worldwide President and Chief Creative Officer Gary Marsh has announced that Star Wars Rebels has been renewed for a second season on Disney XD. "The global expectations for this series could not have been any higher," Marsh said. "I am proud to say that the team at Lucasfilm has delivered something that has surpassed even that incredibly high bar – artistically and thematically." The series has received a warm reception from fans and critics since it debuted at Comic Con International: San Diego back in July. Last week, it was released on WATCH Disney XD and other digital platforms. Star Wars Rebels will be introduced via a television movie, Star Wars Rebels: Spark of Rebellion, which premieres tomorrow at 49:00 p.m., ET/PT on Disney Channel in the U.S. and Monday, October 6 at 8:00 p.m., ET/PT on Disney XD. The series itself will launch on October 13 at 9:00 p.m., ET/PT on Disney XD. The series will air in 34 languages across 163 countries. 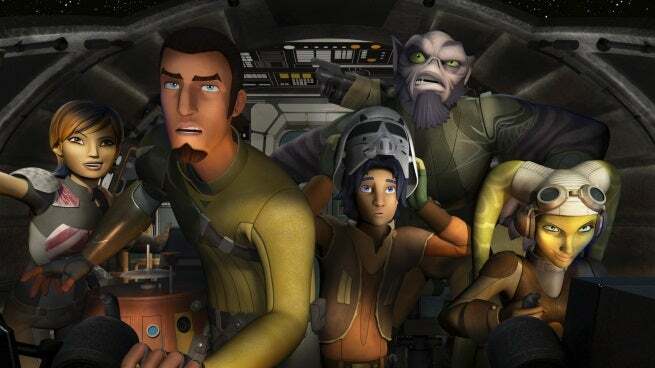 "We all love making Rebels, so we couldn't be happier that it's moving into a second season," says Lucasfilm VP of Creative Development Kiri Hart. "Our fantastic creative team is dreaming up new stories for the crew of the Ghost that will expand their experience of the galaxy and deepen their heroes' journeys. The fan response to the show has been amazing, humbling and inspiring. We're looking forward to the adventure ahead." The creative team behind the second season of Star Wars Rebels includes Executive Producers Simon Kinberg and Dave Filoni, and Co-Executive Producer and Supervising Writer Henry Gilroy. Star Wars Rebels is set in the era between the film's prequel trilogy and original trilogy and promises to bridge the two both aesthetically and generationally. It features fantastic icons from "Star Wars" while introducing a new generation to the far corners of the galaxy.